Remember that vintage sewing machine I showed you a couple of weeks ago that needed a base? Well, I finally found one and I'm extremely happy with it. My machine fits inside the box perfectly. Workmanship is excellent. Cherry wood. It's exactly what I was looking for. It even has a little compartment for storage. I bought it on Etsy from this guy. Don't you love it?? Love the engraved Singer logo. I bought a 1/4" foot for my OTHER vintage machine recently and I expect it will fit this one as well. So I'm all set now. Of the two, I love this little baby best. Okay, so now I have two vintage machines. That's it. I have a tiny sewing space and hardly any room at all so I am NOT starting a collection, I am NOT starting a collection . . . . Patterns for the quilts are included. This is always a great calendar. But, be warned - they do run out fast. Trust me, come January, you will have a hard time finding it anywhere since it's not like a book, only so many are printed up. So it's a good idea to get one now while they're hot and in stock. Check your local shop or see Martingale's website to buy one. 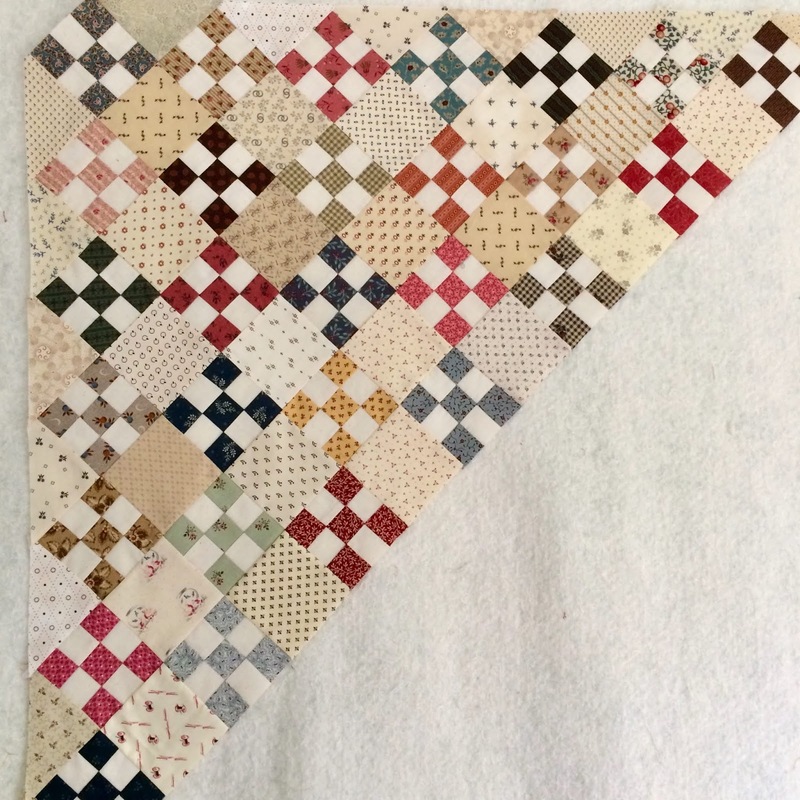 I'm working on a version of the nine-patch quilt on the cover. 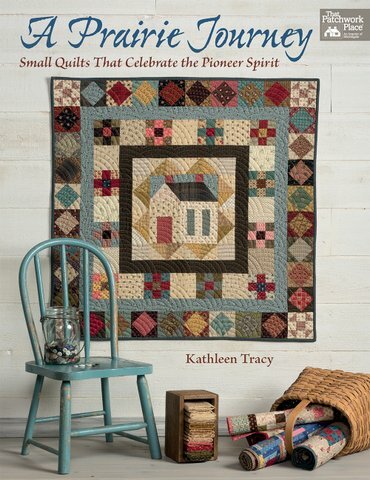 After I spotted this quilt in the book Preserving History, which was published a couple of years ago, I couldn't get it out of my mind. But the nine-patch blocks in that book were very, very tiny, which made me a little uneasy. So, I started making some little 3" x 3" blocks last year, which were much more manageable. For me, at least. Just lots of simple nine patches made from scraps. I challenged myself to make a few every day or at least 10 a week, in between everything else. No pressure. I loved the quilt so much I knew that once I started I would eventually finish. I set the blocks aside for awhile and then decided to pick them up again in the spring. Started making 10 a day, which wasn't too bad because they went pretty fast. Pretty soon they added up. 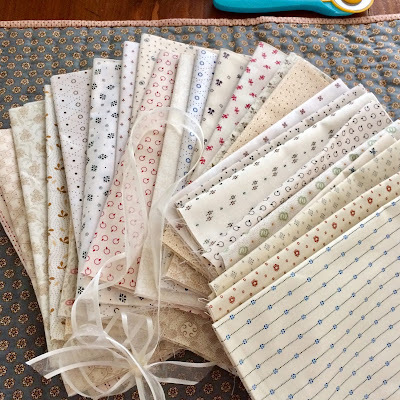 When I finished making a few hundred blocks, I sorted through some of my favorite shirting prints (Okay, yes, I bought some new shirtings too), cut 3 1/2" squares and paired them with the blocks. This is what I've done so far. I know, I know, it's going to take me forever, but I love it already. Little at a time . . . .
As I mentioned, the quilt is a version of The Birthday Quilt by Julie Hendricksen, in her book Preserving History. (And, yes, the pattern is also in the calendar.) I made my blocks 3" x 3" instead of the smaller ones in the original pattern. Good move, let me tell you. That quilt is beautiful but I never would have gotten this far if I had to make over 1,000 teeny tiny blocks. It's been fun and I hope to get it finished before MY birthday, as a gift to myself. Then maybe after that I'll get back to working on putting the rest of my Dear Jane together. Sigh, so little time to make everything. More on that next week. 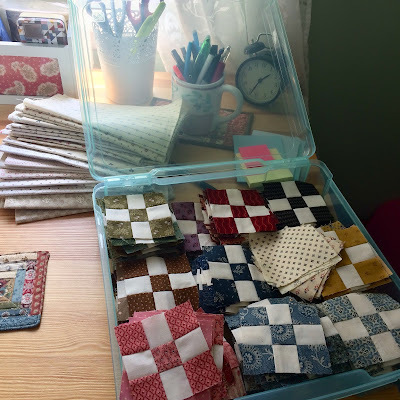 Good morning, quilters - I have to say I'm happy to see so many of you are loving this month's challenge - Sewing Box Scraps (from my new book, A Prairie Journey). Your quilts so far are lovely. I chose it for a reason. 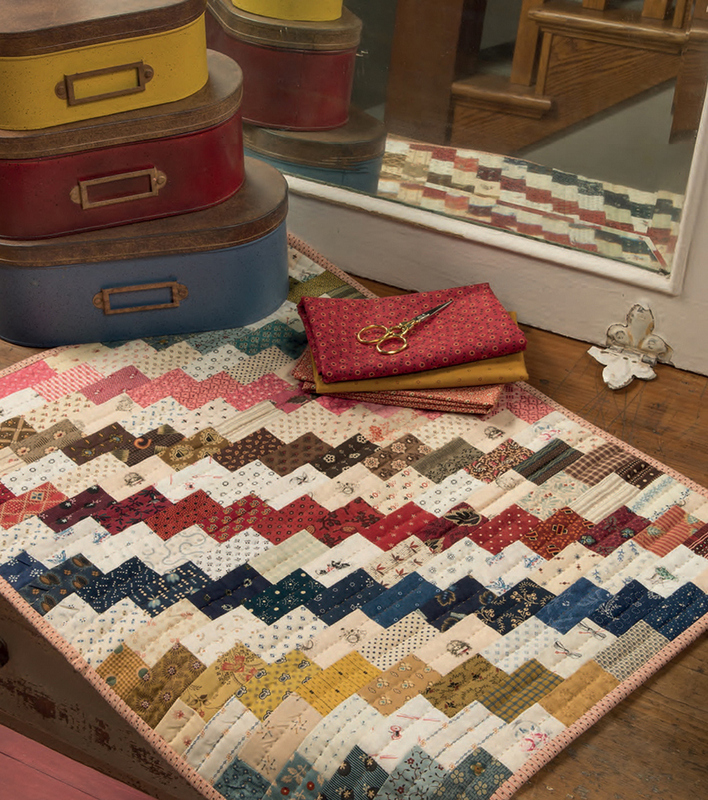 It's a great quilt to practice making scrap quilts. 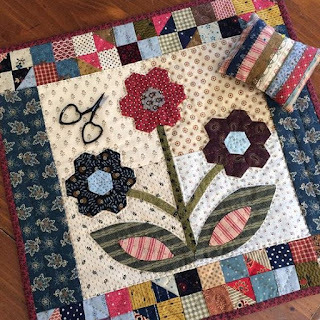 But, I know that some of you have a hard time with scraps and maybe, if you're a beginner, you just don't have that many scraps to make this one. This is something you can accumulate over time. 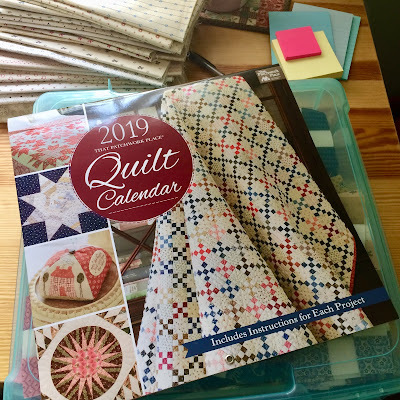 I wrote a blog post last year on this subject It may help some of you who struggle with making scrap quilts. If you love making little quilts, and you love the scrappy look, then you really don't need a huge amount of fabric by the yard. If you're like me and have a small sewing room, then it has to be contained. You just need a nice variety of prints in all different colors and a good way to store them. These can easily be small cuts. Because it can be overwhelming when you enter a quilt shop, with so many fabrics to choose from, why not make more frequent trips to build up your collection? A good fabric wardrobe, I call it. Like a nice basic wardrobe where all the pieces work together for many outfits, a nice variety of prints in all the colors will take you anywhere. 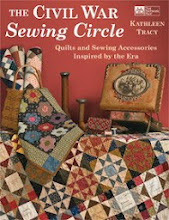 You can add to this as you continue your quilting journey. Try this - Start with your favorite color, then buy 5 or more pieces of fabric in that color. These can be 1/4 yards or fat quarters, does not have to be a yard. I like to buy smaller prints like geometrics, tiny florals, stripes but throw in a few larger prints too. Next week, buy a few more pieces in a color that coordinates with that one. As you go on, week after week or month after month, make sure you have at least several prints in these shades: light and medium blue, pink, indigo, brown, red, green, gold, tan, cream or shirting prints, black, gray, purple. Add a few checks or plaids if you like. Within a short time, you will have accumulated quite a bit of fabric for a nice collection. It will be easier to add to it over time. Then you can begin buying larger prints you love for the borders for your quilts. But, first, start with the basics. This quilt below is a perfect example and you can see I've used a good variety of prints in all different colors. Storing your fabric is important. I sort and store according to color. Plastic bins or drawers, photo boxes, large zip lock bags, all work for scraps. Throwing them into a large bin does not work for me - too much of a jumbled mess and I can never find what I need. If they're sorted, they're easily accessible when I want to start a project. It's also a good way for me to see what colors I am lacking and need to buy more of in the future. I started making something last week and realized I was low on green and gold fabric. These are not my favorite colors but l still like to add small pieces of them to a scrap quilt. Now, this is in my head for the next time I shop. Move over, Blue! 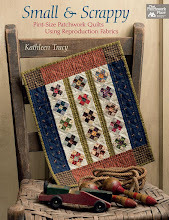 The small quilt challenge for August in my online groups is Sewing Box Scraps from my book A Prairie Journey. I used some reproduction fabrics called conversational prints in some of the "bricks." These were novelty prints that were popular around the turn of the 20th century and contain image children, animals or other common themes. 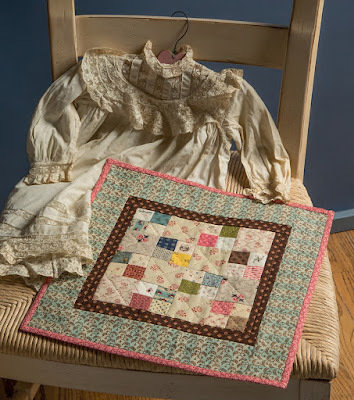 Conversational prints like these are a great way to add a little bit of whimsy to a quilt. 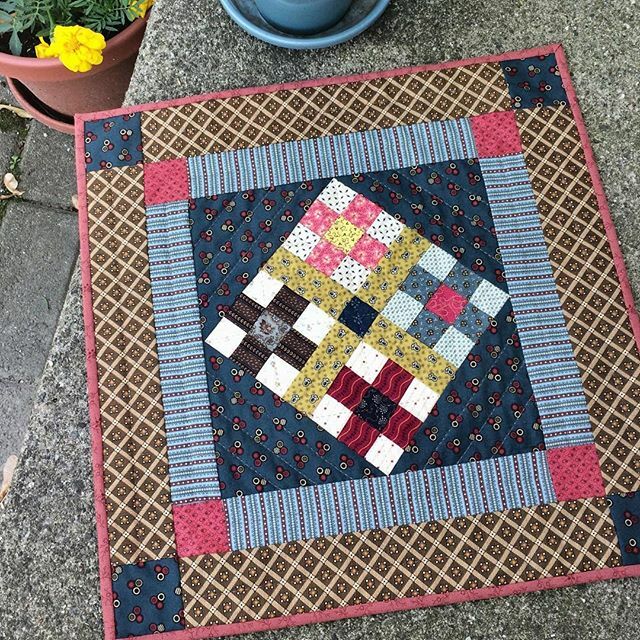 I love this little "bricks" quilt and had fun going through my scraps and finding prints that would blend well together and give it that "olde tyme" look. 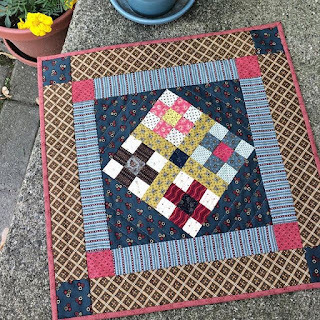 Making this quilt was a lot of fun and I think it will be good practice for some of you to play with your fabric scraps as you put together another scrappy quilt. Use any type or color fabric you like. You can see that I used a variety of reproduction scraps in several different colors to give a little interest instead of using just one red or one brown row. Make your colored strips in the same color or fabric if scrappy doesn't appeal to you. 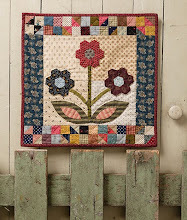 You can also easily make this into a charm quilt - use a different scrap for each piece. Judie Rothermel had a great line of fabric called Classic Conversationals a few years back and sometimes you can find these old out of print fabrics on eBay or Etsy.